What is the Sound Science project? 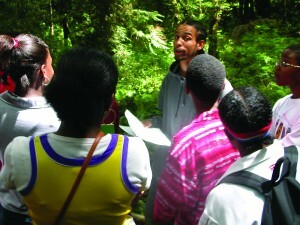 Often urban and rural youth have little contact with nature and have had negative experiences with learning science in schools. To provide a positive experience that associates science with activities that are enjoyable and meaningful to youth, Research Ambassadors collaborated with the “Gear Up” program and “Sound Adventures” to create a unique program – Sound Science: Gear Up with Music. 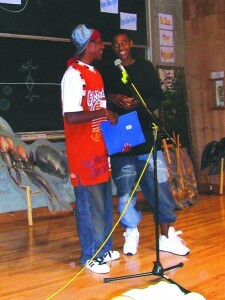 In this week-long project, scientists presented aspects of field biology and the study of nature to urban and rural middle school children and provided them the means to express their experiences in music, mainly rap music and spoken word poetry. 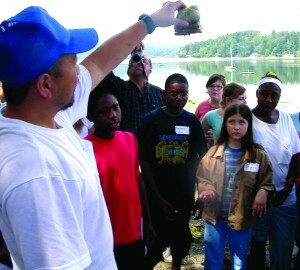 Research Ambassadors, including a forest ecologist, an entomologist, and a marine biologist, led outdoor activities designed to expose 40 middle school students to the hidden worlds of nature and to involve them in the active scientific study of those worlds. After the field portion each day, students composed original songs and poems about their experiences in the forest, with thatch mound ants, and on the beach. Professional rap artist C.A.U.T.I.O.N. participated in the field work and guided students in the making of music. At the end of the week, audio engineers recorded the original lyrics performed by the participants about their experiences with science and the natural world. The students and sound engineers produced a CD comprised of 12 pieces of music, rap and spoken word poetry. The level of quality was very high due to the guidance of the professional audio engineers. Students evidenced a great deal of pride in the final product, and vocalized their eagerness to share the CD with their friends, family, and schoolmates. At the closing activity, 90% of the participants concurred scientific learning was fun and that they had learned a lot about the hidden worlds of the forest canopy, insect behavior, and marine biology. 85% of the participants stated that they would recommend their friends attend future Sound Science programs. Duke Brady, Evergreen State College sophomore, wrote several raps during the event, including this freestyle rap.